Gone are the days when "crunch" was just something you did with a biscuit. The credit crunch has become such a major issue for households that it has entered into the official lexicon. The latest edition of the Concise Oxford English Dictionary (OED) carries a definition of crunch as "a severe shortage of money or credit". Other new entries include "non-doms" and "sub-prime" from the business world, plus "custard creams" and the decorative headpiece, a "fascinator". 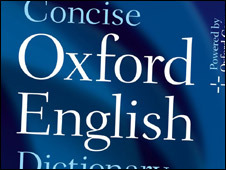 The Concise OED has been in print since 1911 and the new revised eleventh edition contains 240,000 words, phrases and definitions. "The new words included in the latest edition reflects the sometimes contradictory preoccupations of our time," said project manager Angus Stevenson. The squeeze on mortgages has led to the entry of "credit crunch", along with the US source of the crisis - the "sub-prime" home loan to those with a poor credit history. An office that is home to high-pressure telephone sales - a "boiler room" - also makes it into the new edition. In other walks of life, the "custard cream" has been honoured thanks to it being voted the UK's favourite biscuit. A "sleb", the informal word for a celebrity, the Scottish adjective "drookit" which describes being extremely wet, and the soft drink "mocktail" also make the grade. Internet users will also recognise the Facebook definition of "poke", and the word describing the use of numerals or characters to represent words - "leetspeak" - in the new edition.